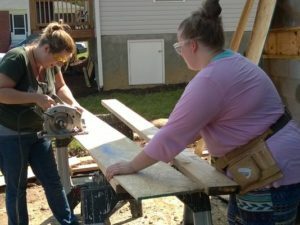 Reporter Beth Walton works with Amanda Ellsworth on her new home in Swannanoa, Ellsworth and her husband, Cory Artrip, are taking part in Mountain Housing Opportunities Self-Help Homeownership program, where participants work together to build their own neighborhood. Families and individuals in the Self-Help Homeownership Program work cooperatively for up to 10 months to build their neighborhood together. With the guidance of a MHO construction supervisor, they frame their homes, put in the floors and walls and provide each one with an individual touch. MHO Self-Help subdivisions have been built in Swannanoa, Leicester, Black Mountain and Weaverville. No one moves in until all the houses are finished. “I can actually say now I know how to frame a house,” said homeowner Amanda Ellsworth, 27, as we worked on her house together. Volunteers frequently work side-by-side with program participants, and I had the priveldge of operating a circular saw with Ellsworth one weekend not too long ago. “Most of it looks great,” she said, laughing at my sloppy cuts. Ellsworth smiled behind a pair of work goggles as she gently corrected my rather jagged corner. She patiently explained the correct way to use a chalk line and how to measure the plywood. To me, the pile beside us looked like a bunch of giant jigsaw puzzle pieces. To Ellsworth, it was her home. When Ellsworth and her husband, Cory Artrip, had their first child 18-months ago, they knew they wanted to raise baby Alexander in a home he could call his own. They see their new 3-bedroom house in Swannanoa as the foundation of a family tradition. Once they move in, they plan on never leaving. The family currently rents in Black Mountain, but wants more financial stability. They can’t control the price fluctuation on their rental and want a place where baby Alexander can study for his college entrance exams and return home to after university graduation. Ellsworth is a nanny. Her husband is a painter. She said there was no way the two could afford a house of this size without the help of MHO. Their new home on Getaway Drive was appraised for $208,000, but the family will pay no more than $139,000. Participants in MHO’s Self-Help Program have to income qualify. Limits in 2016 were set at $32,450 for a single individual and $46,300 for a family of four. Participants volunteer their labor in exchange for a low-interest interest rate mortgage supported by the United States Department of Agriculture. Their “sweat equity” lowers the buying price of the home. MHO’s Self-Help Homeownership Program provides families and individuals the opportunity to achieve the dream of homeownership and beyond, said construction supervisor Joe Quinlan. Usually, it is the first time a family has ever owned a home, he said. These are new homes, not fixer-uppers. The financing is set up to allow people to move in with a good equity position that can free up their fiances to do things like send a child to college. The time the participants spend working together promotes group accountability, Quinlan said. It also builds a neighborhood of people who care about each other. Just down the street from Ellsworth, Swannanoa resident Larry Shook sips on coffee and enjoys a morning devotional before reading the newspaper. Children from the neighborhood gather on his porch, petting his black Labrador Retriever named Noah and listening to his stories. Shook, 67, maintains the hardware storage for the Self-Help Homeownership Program in the neighborhood that boasts mountain views. He, himself, was a participant not too long ago. Shook, a veteran, lives on a limited Social Security and disability income. He is a Diabetic and has neuropathy in his feet. He no longer has feeling in one of his toes. These days Shook sits on the porch he helped build every morning. Ellsworth can’t wait to do the same. The best thing about getting this home has been building it, she said. During our break, Ellsworth points to the houses up and down her street. She talks about each of the families. One woman has four children and their house has a huge laundry room, she said. And, with a neighborhood as wonderful as that one, I don’t think I would either. This is the opinion of Beth Walton. Each week a Citizen-Times reporter volunteers around Asheville and shares their adventure with our readers. If you’d like us to visit your group, contact me at bwalton@citizen-times.com or 828-232-5851. More at www.citizen-times.com/mountaincauses. 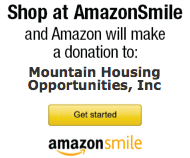 Mountain Housing Opportunities is always in need of volunteers and support. The nonprofit is hosting its 2016 Housing Warming Party Nov. 16 at The Venue, 21 N. Market St. downtown. The public is invited. Tickets are $40 per person or $75 per couple. There will be live entertainment and complimentary beer, wine and hors d’oeuvres. For more information, visit www.mtnhousing.org or contact Mountain Housing Opportunities at 828-254-4030. To view this article in the Asheville Citizen-Times, click here.